Warsaw Parks and Recreation Department council representative, Diane Quance, and Cooper. 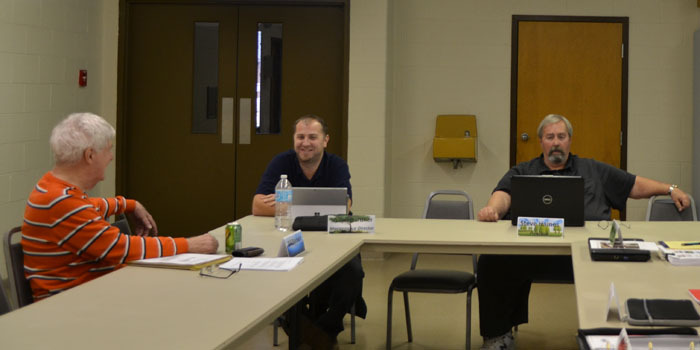 WARSAW — At the Warsaw Parks and Recreation Department meeting held Tuesday, Feb. 21, Patrick Brown of SiteScapes Inc., Mishawaka, informed board members that the DNR review regarding the 5-year plan was very favorable. Brown advised the DNR did ask for more data regarding social and economic factors such as employment, income and poverty. Brown stated that he will incorporate that information into the plan. The thirty day public review has just been wrapped up, and Brown told board members that he will be meeting with Parks and Recreation Superintendent Larry Plummer next week regarding revisions for the 5-year plan. Maintenance Director Shaun Gardner gave a 2016 maintenance report review. Garder stated that projects for the past year included building a picnic shelter at Bixler Park, redoing the south roof at the Pete Thorn Center and adding LED decorative lamps at McKinley Park. Gardner stated that an ADA compliant ramp and door were installed at cabin 3 in Lucerne Park, adding that the ultimate goal is to make all cabins at Lucerne ADA accessible. A Barber surf rake was purchased after a study completed by the Center for Lakes & Streams from Grace College found that the contributing factors for E. coli were mainly fowl droppings. Gardner said the rake picks up everything from seaweed and bird droppings to cigarette butts. Gardner reports he does not think they had a single beach closing due to E. coli this past summer since they began use of the rake, adding, “It’s a step in the right direction.” Board members agreed that not only is this helping to make the beaches safer but the beach areas also look nicer. Other projects completed include installing new park signs throughout the parks, pulling out and replacing old bushes at Nye Park and redoing the main overhead power line at Pike Lake Campground, as well as installing new 50 amp outlets at each site. Recreation Director Sheila Wieringa gave a recreation report for the 2016 year. Wieringa reported tentative plans to expand the Daddy’s Little Sweetheart Dance event to two evenings in the future due to an overwhelmingly positive response from the public. It is hoped that by doing this, everyone who is interested in this event will have the opportunity to attend. She informed board members that tickets to the 2017 Daddy’s Little Sweetheart Dance, which was held earlier this month, sold out in less than four days. Tentative plans were discussed regarding having food trucks at Central Park during lunch hours on Mondays. January meeting minutes were approved. The next regular meeting will be held at 5:15 p.m. Tuesday, March 21. Pictured, from left, board member, Bill Baldwin, maintenance director, Shaun Gardner and board president, Steve Haines.